The technique is clever in it's simplicity. Let's take a look. Multiple shadows happen by using a comma separated list. In the above code, there are two shadows, one offset by 1px on both axes with no blur, the second by 2px on both axes with no blur. See the trick? We can apply multiple shadows, each offset by 1px from each other to build a "tower" style shadow below it. By default this would apply shadows deeper and deeper underneath the text, but we can appear to have it "pop up" by having the shadows only appear on hover and moving the text up and to the left the same depth of the shadow. Note: See CanIUse.com for browser support of CSS transitions. So what happens in Internet Explorer? Text shadow won't work, but the positioning will. It's not as pretty but it's totally acceptable. If you plan to use this somewhere, be inspired by the idea and the technology, don't just rip off David's footer. David Desandro does amazing work. 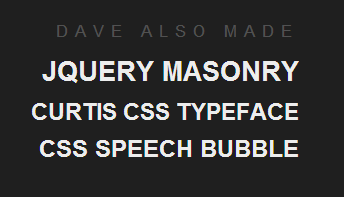 Love his “Curtis” typeface, the jQuery Masonry plugin, and his Quickie Canvas tool. He’s equal parts wizard and artist…definitely a source of inspiration for me. Cool, but in Firefox in Windows (XP) the text isn’t so clear. And that also effects the shadow, which gives it a very blocky feel. It’s a shame FireFox doesn’t do anti-aliasing in windows. This effect would be even better with a CSS3 animation! Very nice effect. Too bad IE users miss out on so much. That is a really neat hover effect. Reminds me of a Paramount Studio spot light action…. The link for the “download files” seems to be broken. Thank you so much for your informative articles! The more often I come here the more I learn. Great site, Kudos! Just needed to say this, since I’m leeching off your site for quite a while now. Interesting to see you pick this up… I found Masonry the other day and attempted it to display some pupils’ work on my website and the footer jumped out from his website. Check out Masonry some time too! PS. CSS Tricks has helped so much with learning about web design it’s unbelievable. Chris Coyier is a legend in his own lunchtime. Vendor prefixes aside, now that webkit and mozilla are close to incorporating all the new CSS3 properties into their rendering engines, and designers like David innovate with them on live sites, IE is REALLY getting left behind. I wonder what Microsoft will try and do about it? Yes, indeed a very interesting effect. Before you bring up this tutorial, I saw his (David Desandro) site. The effect really caught my attention. Now, the myth has been uncovered, thanks Chris. I haven’t looked into this much for IE, but I believe you could declare an IE filter that will accomplish this as well…? Maybe I’m wrong, because I haven’t actually done it, but most of the CSS3 effects do have IE-only methods, they just aren’t as clean to code or work with. Yeah me too, unfortunately all of our customers do care about it. In a dream world there is only one perfect browser, anyone care to vote on the lucky chosen one? As a long time Mac user you’d think I’d say safari, but the more I use Chrome, the more I like it. That would get my vote. Thanks, Chris. Great post. Two question..
1) Where can we find new vendors properties or new CSS stuff like what you posted? 2) Why isn’t -webkit-transform working on my safari? Just being nice by saying, that is one cool script! Curse you Chris!! I was planning to write about that effect in my next article… Ah well, great job mate. Brilliant effect! I used to use letter spacing with transitions that looked pretty cool… but this is much better. Wow David Desandro, amazing work. Uh, the IE8 one looks better. The effect looks horrible that that font and color combo. wow, I knew about the transformation, and using that with text shadow and :hover but this is just so smooth! Very nice! I think, i can find where i can apply this trick. Really like the way David Desandro’s site uses the CSS shadows, the colours used in the footer text really work nicely as well. I’ve only recently started to put CSS shadows onto text, wasn’t keen on the idea due to W3C compliance etc and I really don’t like using fixes. But I think using them is fine as long as the text still looks “good” in IE. But I think there is a good enough percentage using firefox, safari etc to justify using shadows throughout a site design. Subtle shadows here and there can really transform a website, and the classic way of just using an image can work but is no good for SEO. Especially for headers and company names. Thanks for posting that site and how he has done it, really useful tip! Im gobsmacked my the type david made! Nice… I just wish it worked in IE. Firefox and Safari are really slow at this thing.. But on Google Chrome and Opera it looks fluently and very nice. text-shawdow is very effective and efficient way of replacing drop-shadow images ! Thanks for sharing this will use this. 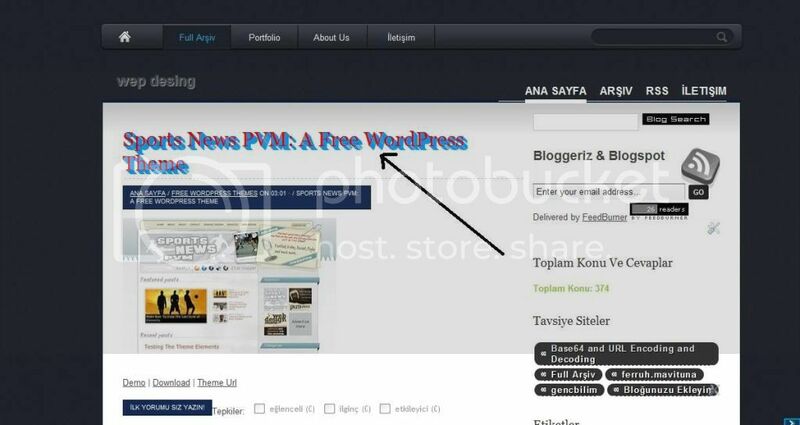 Do you have any idea how I can improve this on IE and Firefox? Very nice effect and it works great. Thanks! This is an awesome effect, well done!